Hi everyone! It’s time for the August My Favorite Things Creative Constructions with Blueprints posting. Today, the Design Team is featuring Blueprints sets with rounded corner elements! To create this elegant flower arrangement, I used the Blissful Blooms and the Birdie Brown Polynesian Paradise stamps and die sets! 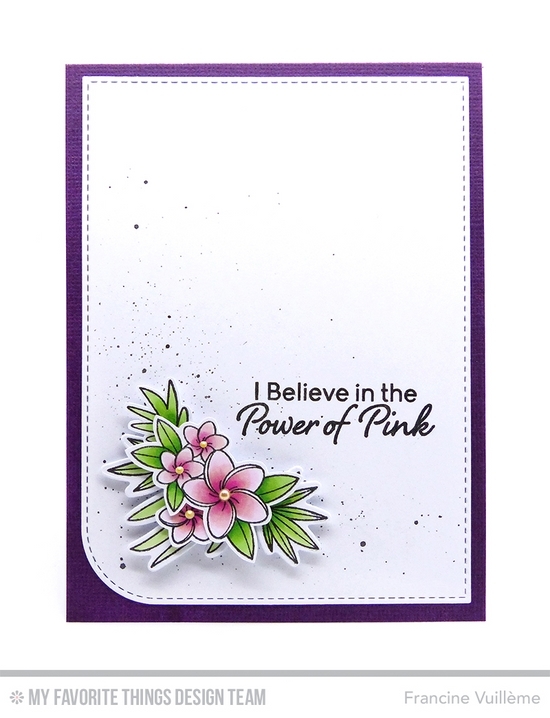 The "I Believe in the Power of Pink" sentiment is from the Have Hope set. I love it! Be sure to check the MFT blog for more inspiration and projects from the Design Team featuring the Blueprints with rounded corners! Thanks for visiting my blog! For more inspiration, you can also check my MFT Gallery on Pinterest! I've seen so many beautiful cards today, and this one is at the top. It's wonderful. I love those flowers. I love this gorgeous card! Ich KANN das nicht! Umso mehr bewundere ich immer Dein Talent so wirkungsvolle Clean & Simple Karten hinzubekommen. Deine Karte ist wieder wunderschön, Fancine. I love the power of PINK and this card is so clean, so simple and SO LOVELY!!! Hope you are having a happy, smiley day! !